Milan may have opened with a strong season, but its closing wasn’t all that brisk. In fact, it was just entertaining shows where only one stood out on this day. 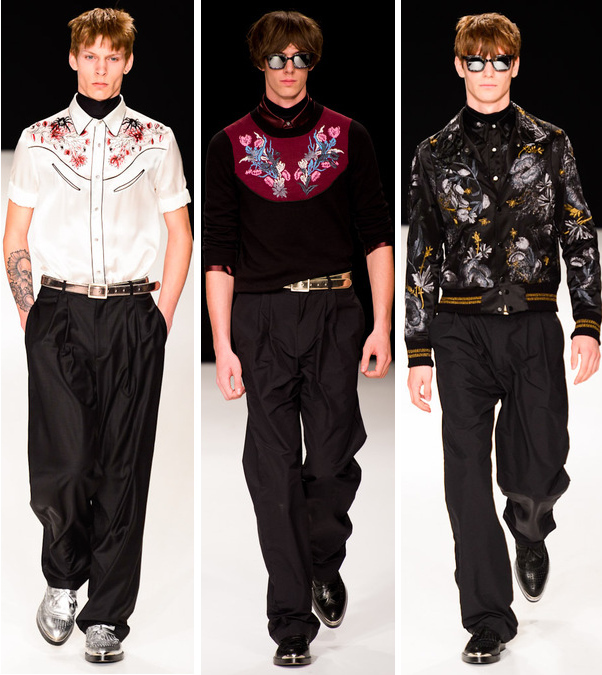 Milan men’s wear shows seem to be making youth part of a lifestyle. 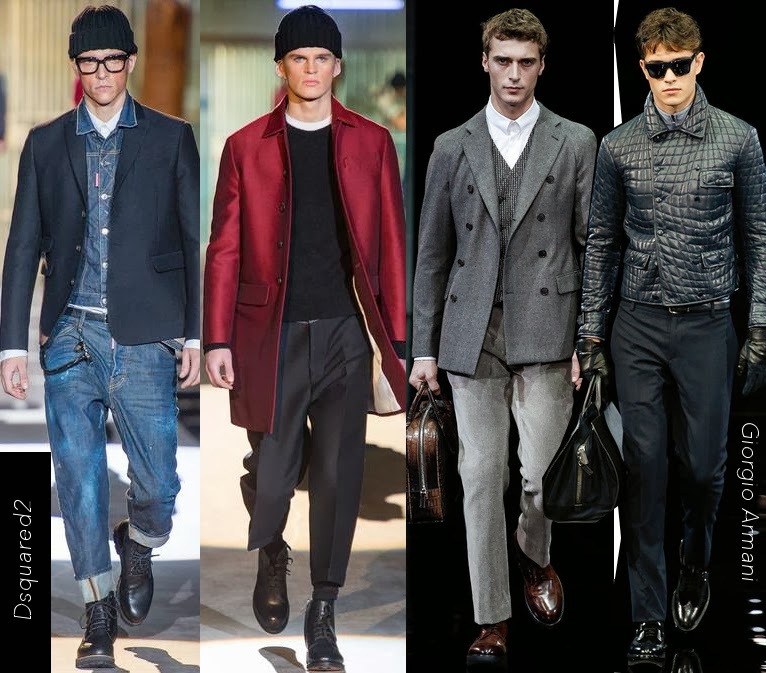 Whether it’d be in vivid tailored suits or sportswear, there were more than few designers this time who proposed young men – casual or dapper - fresh ideas for next fall 2014. At Salvatore Ferragamo, creative director, Massimiliano Giornetti, left the sportswear aside and returned back to the roots of the brand: dandy tailored clothes in luxurious fabrics and textures. The only problem is they came with certain defects. It looks like Tomas Maier keeps adding high records to the Bottega Veneta menswear label. Think about a lazy afternoon weekend where all you really want to wear is a pair of jogging pants, sweatshirt or Henley, and a nice pair of sneakers. Well, that’s exactly what went on at Bottega Veneta’s presentation Sunday morning. Except, being Maier, he elevated it to the next level. Turning that slacker into the most stylish and ultra luxe gentleman he is. 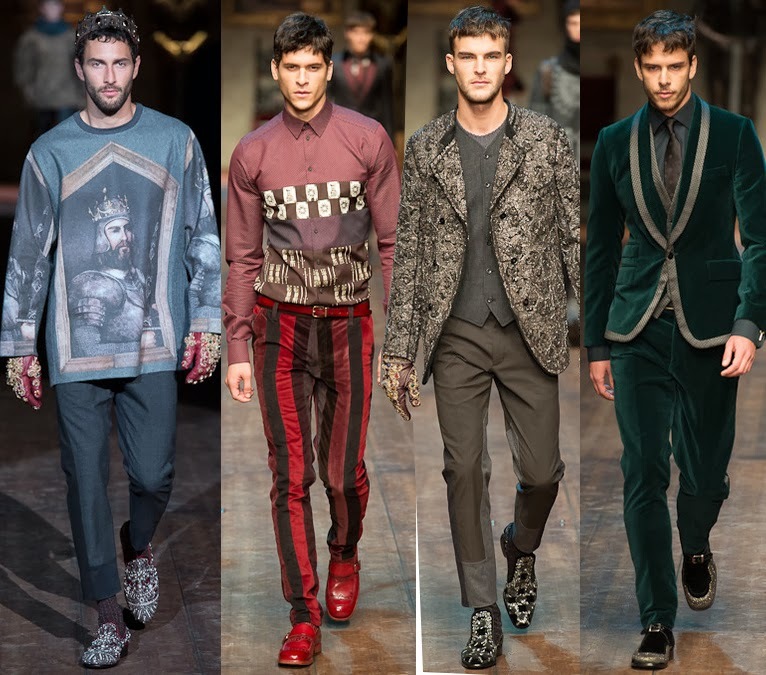 At Dolce and Gabbana, the duo came out with a Norman inspired theme. Domenico Dolce and Stefano Gabbana have been playing it safe with their Sicilian inspired themes over the last couple of seasons. And I’ve been a fan of this brand for quite some time, but for some particular reason, I felt this was not their season. They came up with beautiful prints – such as the Norman Kings that were sent out at the beginning of the runway – but it is the loosely fitted silhouettes that are not working if you understand. Half of the collection centered on thick embroidery and relaxed forms, but thankfully the other half was more reminiscent. 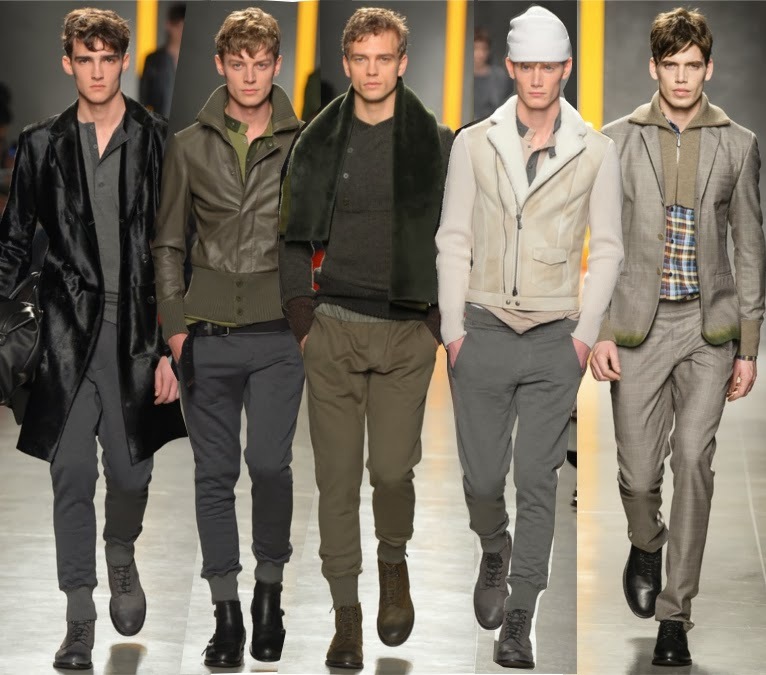 The first day of Milan, men’s fall 2014 fashion week, seemed to have one of the most jam packed designer shows that hopefully won’t steal the exciting essence like it did at London. From Pilati’s second – almost perfect – futuristic approach at Zegna, Dolce and Gabbana’s Normandy Kings, to Versace’s provocative cowboys, and others proved to have compelling collections to talk about. 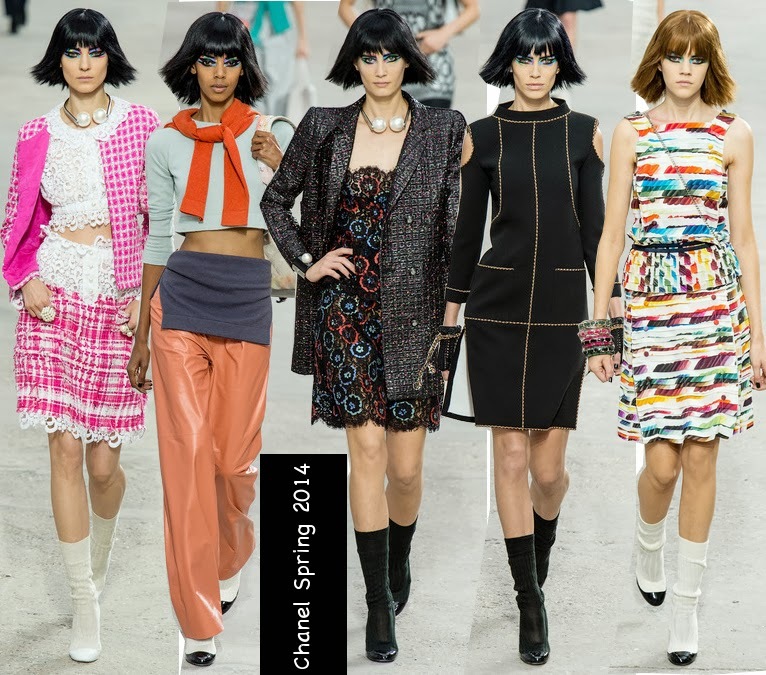 A review from Chanel, Valentino, and Alexander McQueen Spring 2014 Collections. Give Karl Lagerfeld a paintbrush and he’ll probably laugh at you. He doesn’t take art as serious as other designers are doing in their collections. In fact, he injects irony like he did at his Chanel spring 2014 collection; he took modern art and developed it into a chic fashion statement. The setting of the show – an art gallery - consisted of 75 fake art pieces Mr. Lagerfeld proudly stated he did them over the summer. Well, those oversized art pieces weren’t made by him, but you get the idea – he specifically instructed how he wanted it to be done. He must have been the only designer who had fun over the break, because these clothes were nothing but fun pieces of art that were wearable or fit for your salon. 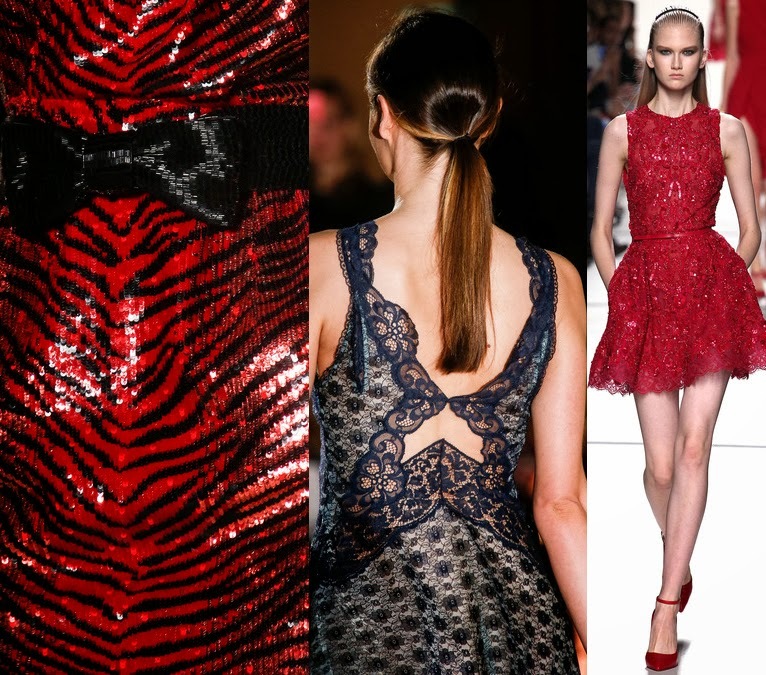 A close-up of a Saint Laurent SS14 red zebra and bow-tie sequined dress; a Stella McCartney patchwork lace dress; a red embroidered Elie Saab dress. 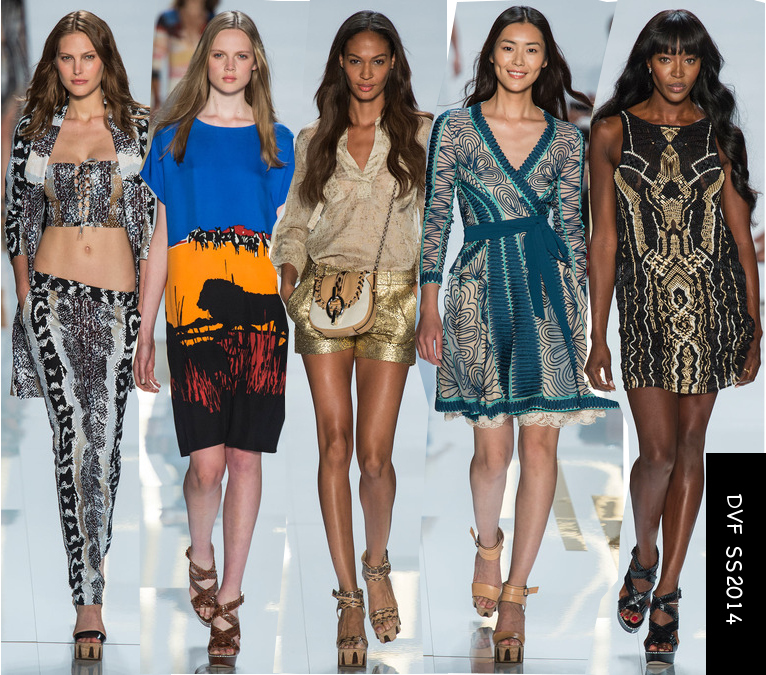 A review of Etro, Versace, and Tod's Spring 2014 collections. 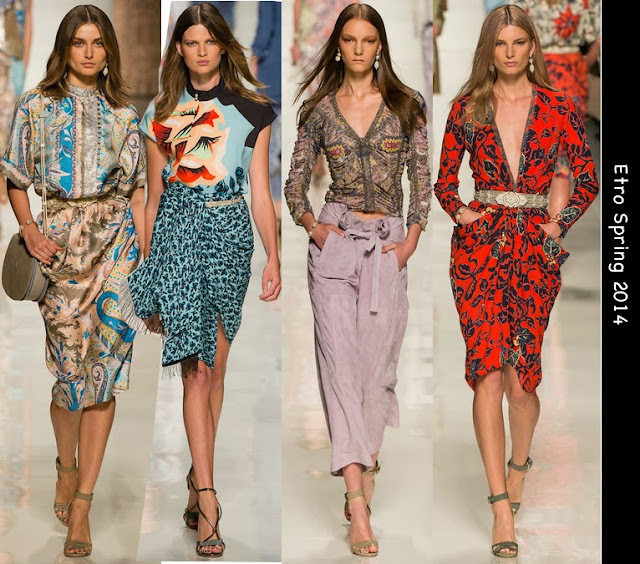 Etro is best known for its signature paisley prints. Last season, prints seemed off for this label; they were just not catchy. But this season Veronica Etro was inspired by her grandmother’s country home. They say that sometimes a family run business serves best if inspiration is taken from a relative’s history, and being grandmother the subject, this collection worked very well. 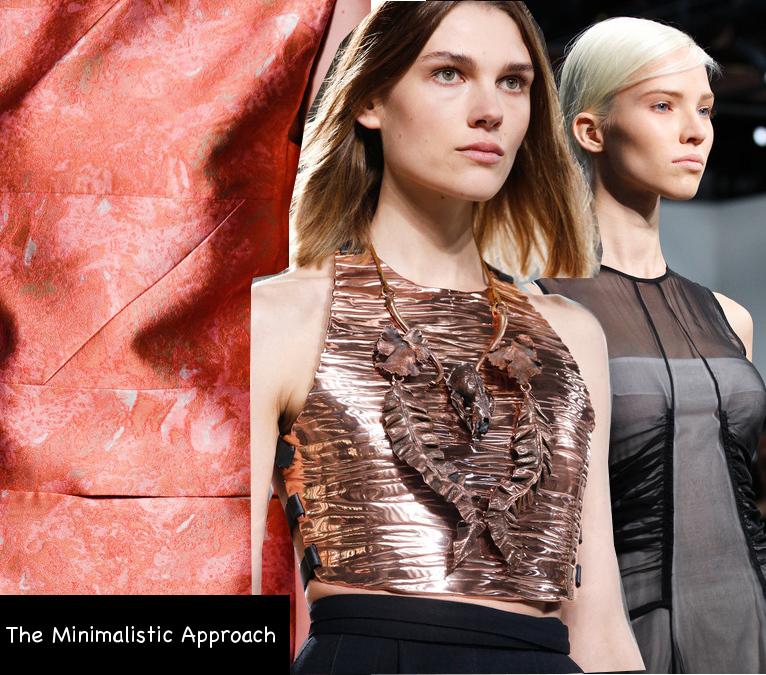 From left: Close-up geometric cuts of a Narciso Rodriguez brocade dress; A bronze metallic textured cropped top; A black chiffon with a ruched detailed bodice. It is no secret that American designers have one of the best luxury sportswear aesthetics women want. Something European designers envy when it comes to loosening naturally in such a manner. 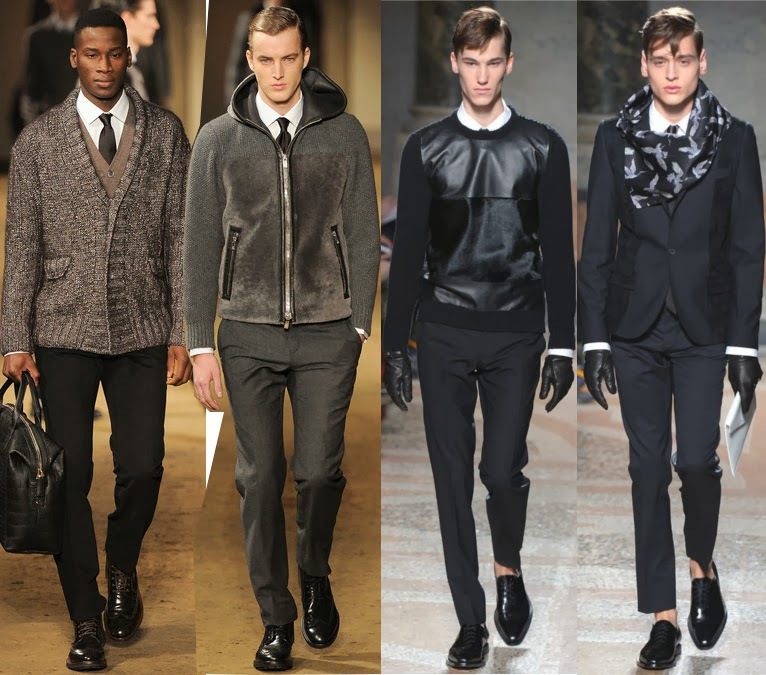 Americans love the mix of casualty, semi-formal, and luxury when dressing up, and American designers understand that demand very well; there was such a minimalistic approach designers took this time with sportswear. 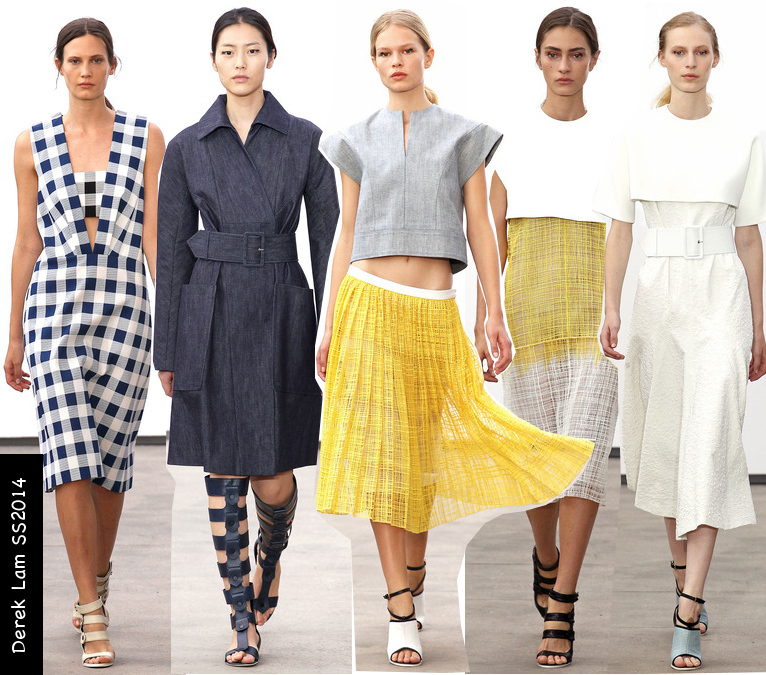 And even though we tend to focus more on international designers at the end, there were fascinating pieces some designers offered for next season at New York Fashion Week spring 2014 that proved to be on top of the league. Victoria Beckham really stepped it up this season. She was looking for a boyish sportswear tailoring look, and she made it look flawlessly chic. Other designers have really gone for the tomboy 90s looks, but not her. There were so many special pieces in this collection that separated her from other designers themes that looked overt (I could name several now). Fashion is not meant for everyone – not even for celebrities who get criticized harshly when in a collaboration – but Victoria Beckham is not a celebrity anymore, she’s a designer who has earned the respect of many. She’s gaining confidence (and a good one) in outerwear. She began her show with a relaxed black and white ruffled top and cropped pants (these contained a very sharp tailoring) paired over a crispy white rounded shoulder suit jacket. There was only one white baseball jacket she showed – detailed with black cuffs and collar, and transparent sheer sleeves – that was breathtaking. Her sleeveless suit vests were also noteworthy. Yes, it was only a small percentage of outerwear, but enough to go for one (or two in another color). Now, if there was anything that assured Victoria Beckham’s designer aesthetics for details and high-tech fabric combos were the following: her midi skirts slashed to show details of pleats underneath (an interesting way to show creativity on layering), and her laser-cut inverted triangles – in fuchsia and white - etched on shirts. Beckham is better known for her immaculate glove-fitted dresses every women dreams of, but this new soft tailoring collection sure does have another run for the money. Oh, and if you wondered how Mrs. Beckham dressed for her applause, she wore a white shirt with her cropped blacked pants. So posh. 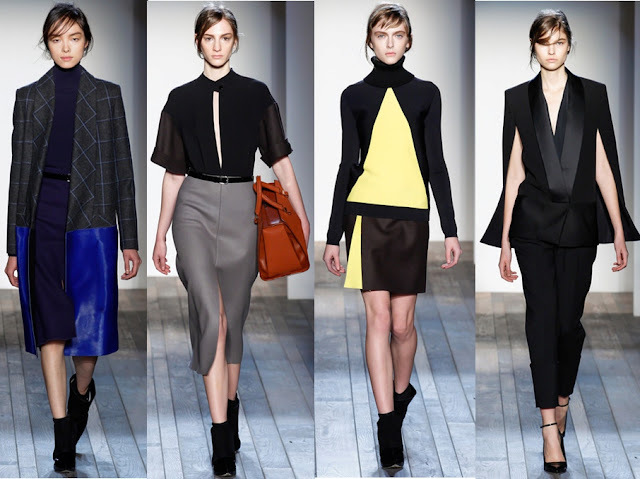 Derek Lam is a designer who has been designing clothes for women. Sounds obvious, but that’s the only thing that comes to mind when you see his collections. 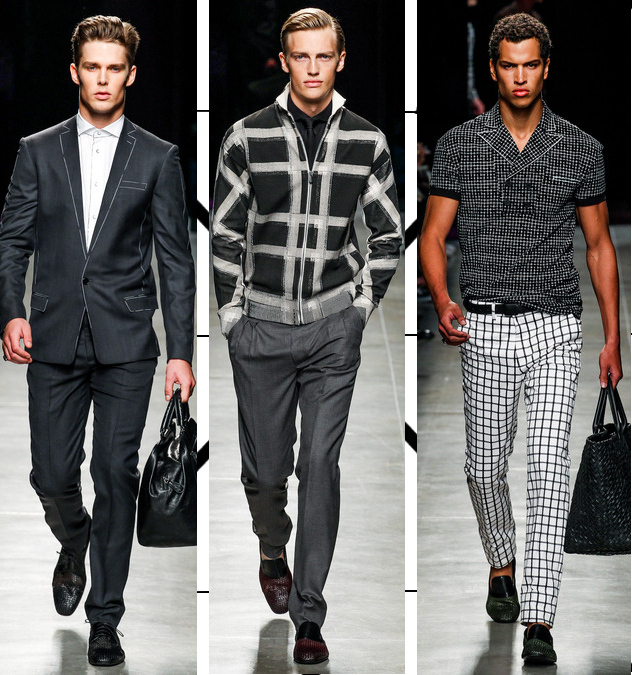 His graphic checked prints were simply easy on the eye. That is what women want. Luxury clothes that looks effortless and gorgeous. There were some that may have not loved this collection, being that Mr. Lam designs for a more mature lady. But for the woman who has the opportunity to encounter with a Derek Lam piece, she sure has come across a beautiful treasure. 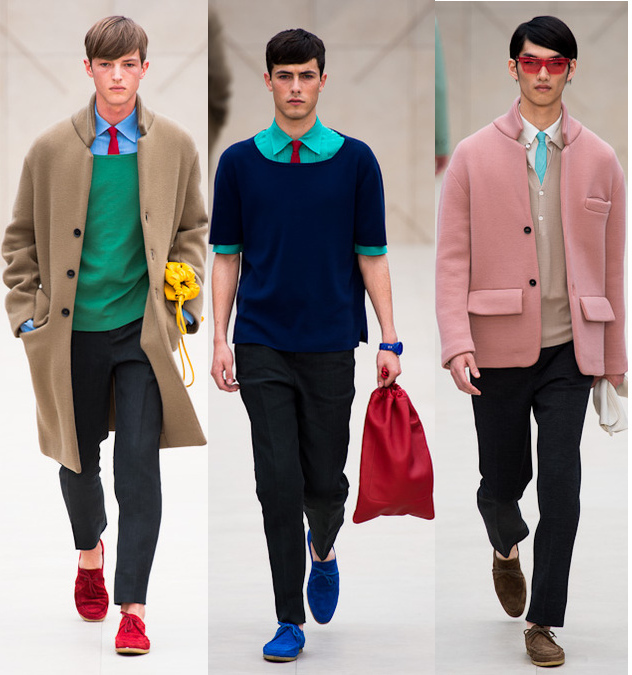 He had lots to offer for next spring 2014; his color-block numbers from last season have been a sensation. His belted coats – washed gray and blue denim – may have looked minimal, but at a close-up you could appreciate all its details. Highly structured raffia skirts (especially one in yellow) and dresses were luxurious for such a fabric. These is how we’d want our mature girls rocking something out, and for younger girls, those gladiator heels. DKNY, Donna Karan’s youthful sister label, conveyed a good energy for next season. 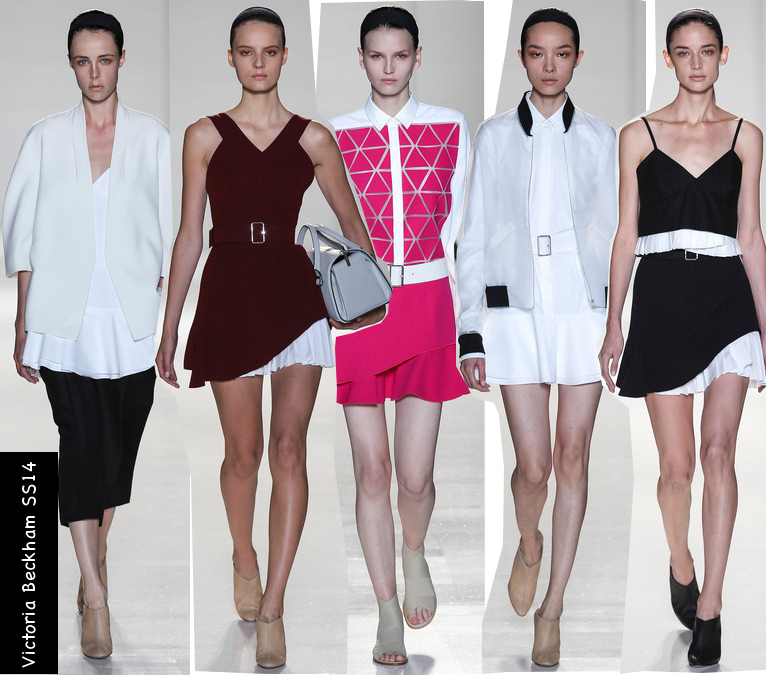 Sportswear was yet again the theme of Karan’s spring 2014 presentation. Honestly, there never seems to be an inspirational theme that focuses on each collection, but the cool sporty looks make up for the uncertain themes. 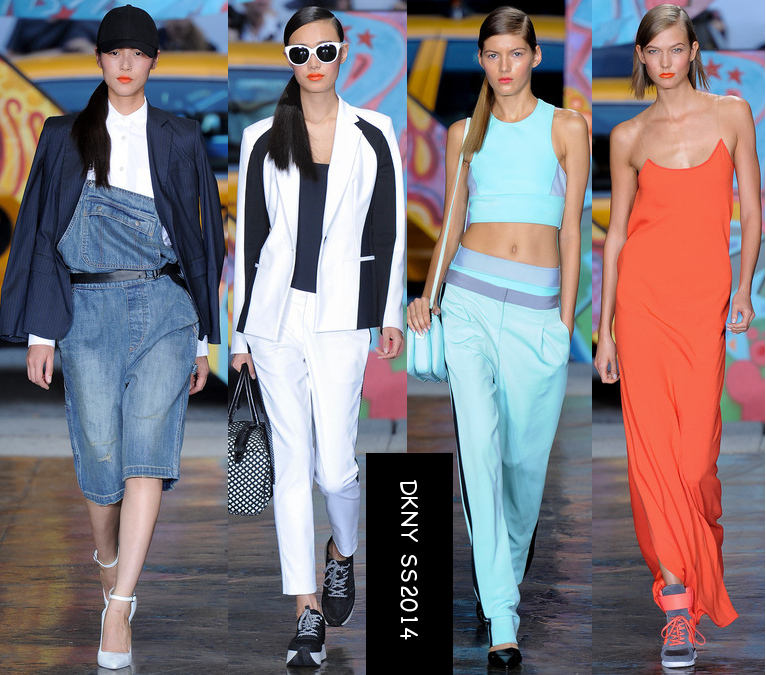 It is a ready-to-wear line after all, and DKNY finds ways to make each season seem different. Her vintage bandana prints were refreshing, while her denim fabrics – overalls and patchwork jeans – sent a 90s vibe that later affirmed with her sneaker looks and logo dresses. Her lavender and turquoise numbers projected much more girl power. One silk orange spaghetti strap dress Karlie Kloss wore seemed appropriate for a casual day to go shopping for some groceries. Diane Von Furstenberg also had an “oasis” going on at her show. Her clothes never fail, are always marketed at fair prices and best of, are made for any type of curvy woman. We can tell she never thinks about clothes they way she wants them to be on skinny girls. Yes, thin models model her collections, but right away there are many options for women to choose from here. There were selections of wilder prints to more tone down ones. She went from nice cropped tops to color-block and animal print gold buttoned denim shirts made for everyone. And her iconic wrap dresses updated to still look good on any woman. The most important part of wearing a DVF piece is having fun in it, and that’s what some of her smiling and graceful models were projecting. This is why she is the president of the CFDA. She herself is her own muse, managing to look youthful in anything she wears at her age, and so should you in her designs. Maybe that’s why she had the queen of the runway, Naomi Campbell, confirm that in one short gold embroidered dress. Age has no limits at DVF. Vibe: Doing Business at the Beach. 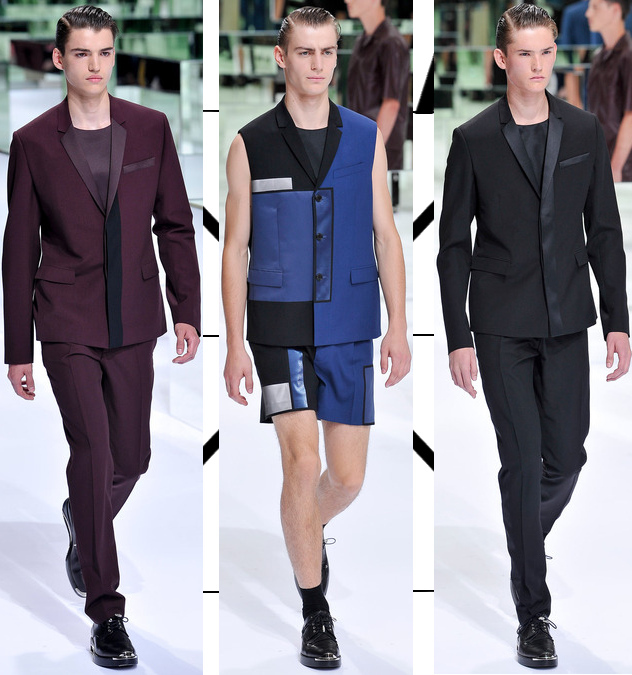 "Just think how you negotiate wearing a tuxedo on a beach," were part of Kris Van Assche's description for Dior Homme Spring 2014 menswear collection. "It's formality and informality: choice, chance, and lightness." Making a color choice was very straightforward here. Red wine, blue, light gray, and black were the only options. Most of the collection became a repetition of either looks in shorts or slim trousers, suits or vests, and in either subtler leather patchworks, that made one reflect what could have been the perfect outfit to go on a negotiation. But what if you were to rewind back to the beginning of the collection and take a closer look at each individual outfit that could have appeared identical for a few seconds? Notice, the chance of choosing the same identical outfit could have just become quite difficult and interesting to think about. It was those small uncommon details that Dior has always been perfect and successful at making one ponder what is the difference about these two? Vibe: The European Traveling Around America. 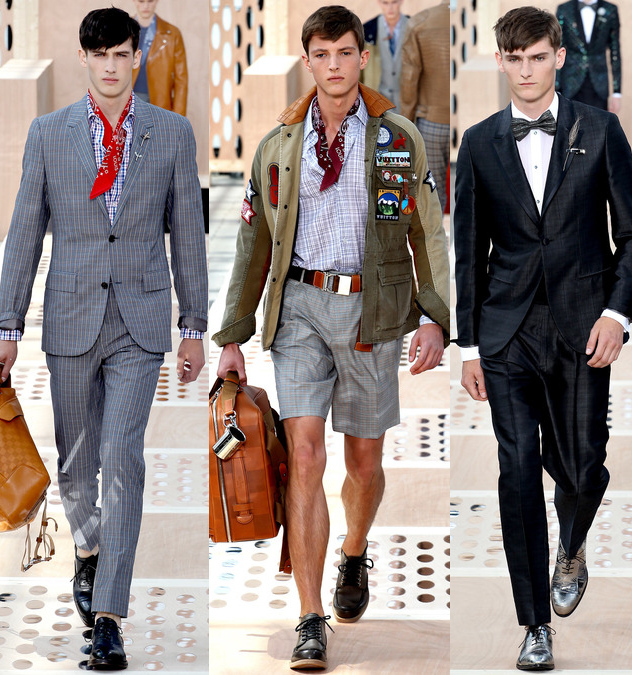 The Louis Vuitton man is an explorer who loves to travel around the world. Creative director, Kim Jones also has a devotion for traveling. It is all a perfect match to deliver an exciting and compelling collection that leaves the Vuitton man with the right clothes to travel the world with style. This season Jones' models were given the pleasure to experience the different styles of American culture that were translated to Vuitton's exquisite DNA. Vibe: Sophisticated Men in Graphic Chalk Marks. Tomais Maier doesn't need much to describe about his cool sophisticated tailoring that has progressed so rapidly at Bottega Veneta. It seems the brand has turned from being just a young teenager to a man with exquisite taste in luxury. 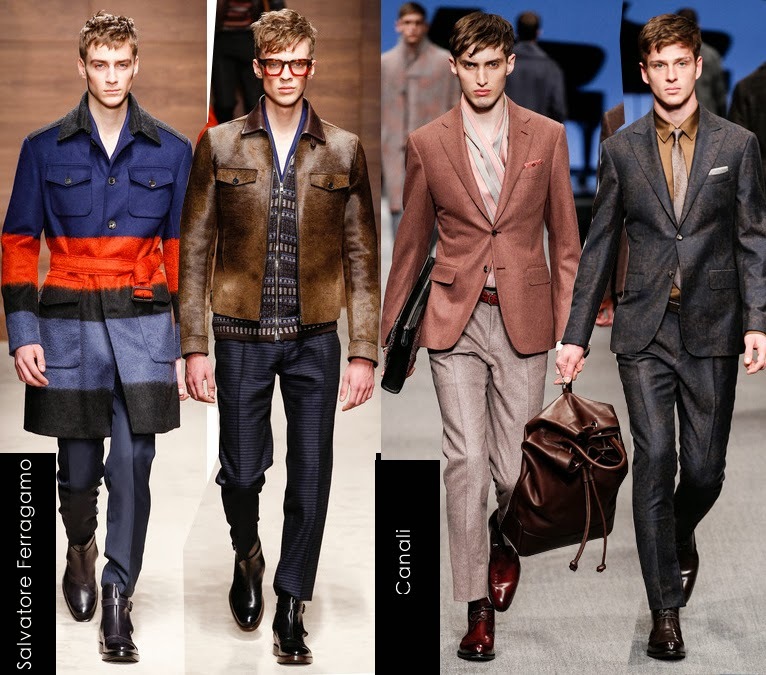 Its spring 2014 men's collection started off fresh and powerful with gray suits - tailored so easily fitted - that shifted into a series of white-chalked outlined suits that portrayed the detailed craftsmanship that goes into making such a suit. They had an illusion, as if the lapels were really sewn it, but if you could get closer you'd see it was only a well played tailoring outline trick. His white subtle button down shirts came with black graphic chalk marks that elevated the mood. Christopher Bailey, creative officer of Burberry, gave us quite a surprise at his Burberry presentation Tuesday morning. London Menswear Fashion Week consisted of only three days worth of great innovative designers, but it wouldn't have felt enjoyable to finish one's final morning in London without such an artful collection like Burberry's. The transition from the Milan menswear calendar to London's may have played a factor in Bailey's theme, but no, it only moved the presentation to a much earlier date. Bailey knows how to influence the menswear market keenly well. The number of male celebrities, bloggers, and street stylists who have become a loyal customer to the brand fill the gap for the rest of us who want a piece of that ultra cool trenchcoat. Semi-length shirts brought a cool vibe in pleated numbers that resembled tuxedo shirts. It has been three years since Warby Parker first launched its online eyewear company back in February of 2010, which did not take long for such a talented brand to be recognized by various fashion magazines – Vogue, GQ, Elle, and Esquire. 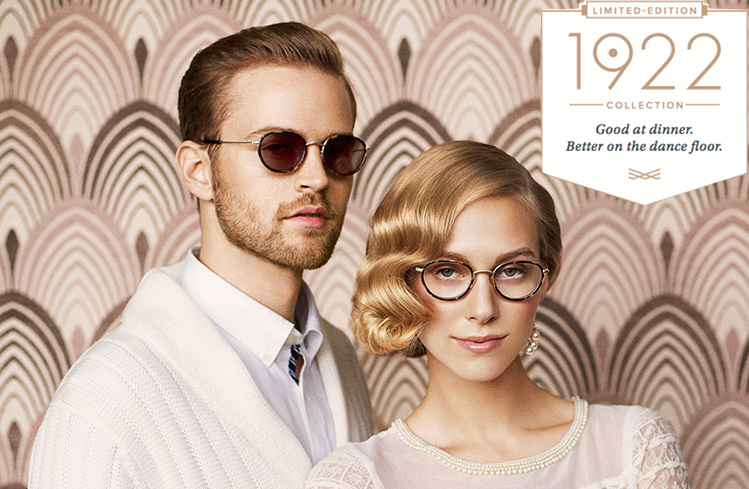 Their seasonal collections of prescription sunglasses and eyeglasses for men and women have boosted them to be one of the most recognized companies in the retail market. I can’t believe it has been about five years since Victoria Beckham first launched her eponymous line. As a fashion addict I’ve only had an understanding of her label for about two years. When I first heard of her collection, I can’t deny I thought it was going to be one of those dull celebrity collections with no significance to the real world of fashion.